Choice Dollars® directions can help support Community Missions. Think of the impact you—along with other eligible Thrivent members—can help make by directing Choice Dollars to Community Missions. The outreach funding we receive from Thrivent Financial through this program can help us meet the needs of our neighbors. 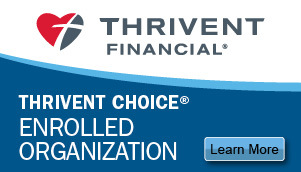 The Thrivent Choice program gives eligible members of Thrivent Financial the power to recommend where some of the organization’s charitable outreach funds are distributed annually, using a vehicle called Choice Dollars®. Since its inception in 2010, Thrivent Financial has provided more than $370 million in charitable outreach funds through the Thrivent Choice program, to help support the initiatives of churches, educational institutions and other nonprofit organizations. For more information about the Thrivent Choice program and Choice Dollars, contact your Thrivent Financial representative. Thrivent is a membership organization that helps Christians be wise with money and live generously. We offer our more than 2 million members a broad range of financial products and services—including life insurance, annuities and mutual funds—along with guidance from financial representatives nationwide. For more than a century we’ve helped member-owners make wise money choices that reflect their values. And we provide opportunities for them to be even more generous where they live, work and worship.